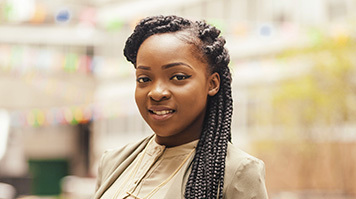 Temi has always had a strong connection to LSBU’s students. She has served as LSBU Students' Union President for the past year and is motivated by providing a better experience for LSBU students. Before I chose LSBU I did my research and discovered the content of the course was perfect for me. When I joined, it was exactly as I expected. Temi wanted to improve the experiences black students have in education and became involved in the African Caribbean Society. She was recognised for her work in the society and was voted in as BAME Students’ Officer, and then the LSBU Students' Union President for 2016. “Getting elected by my peers, to be trusted to look after their affairs and given the power to impact their student experience and graduate opportunities is really quite a humbling experience,” Temi comments. Representing current students in such a large organisation can be challenging, especially where an institution has such a diverse student body. Keeping note of the positive changes, no matter how small that has improved the student experience and taking pride in her role as president is what keeps Temi motivated. “I’m proud to be part of a Union that has helped me grow and develop,” Temi remarks. “I have been able to engage with students from every demographic, creatively thinking and weighing up the benefits and impacts on a broad range of students. I thrive off helping students, adding great things to the student experience. I passionately believe education is the best leveller in society… I wanted to be part of bettering the student experience and developing a university with a great track record for widening participation. With the 2017 student elections approaching, Temi is planning her next step and is hoping to start a Master’s degree to break into the hospitality industry. Find out more about the Students' Union.